Accolades - The Studebaker Avanti got great press all through 1963. 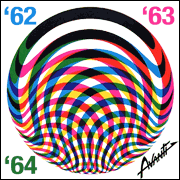 A 1963 Avanti appears in the classic comic book, Archie Pals'n'Gals series, Giant series, Number 23, Winter 1962-1963. The full-page first panel has Reggie roaring to a screeching stop in front of Archie and Veronica. "Holy smokes! It's Reggie! . . . in an AVANTI!" "It's not a Stanley Steamer, hot shot!" The May 1962 Motor Trend honored the Avanti with its first 1963 Road Test. In July 1962 Car Life said, "The Avanti has the eager grace of a thoroughbred, looking as if it were ready to leap into action at any moment." Canada Track & Traffic called it, "A bold, fresh concept with an undeniable feeling of motion that makes Avanti's competitors seem decidedly old-fashioned." Sportscar World said, "Studebaker's startling Avanti has caused raised eyebrows among diehards in the American motor industry, who have already nicknamed it America's 'Ferrari". Car and Driver said, "The Avanti is sensational for its appearance alone, and its performance places it in a class by itself." 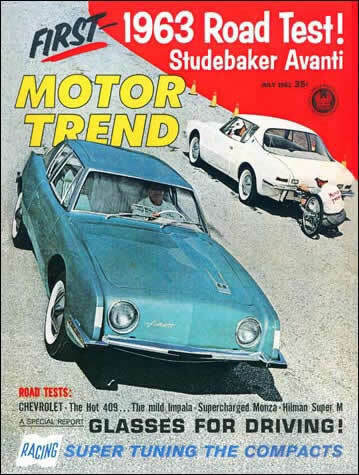 Motor Trend Magazine's road test of the 63 Studebaker Avanti in the May 62 issue. 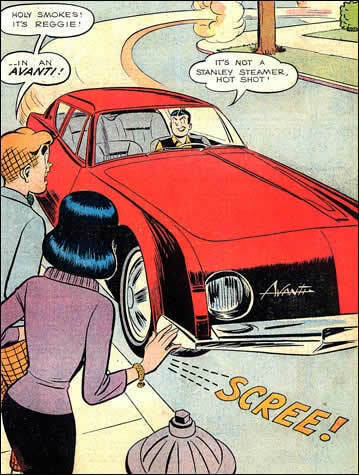 A 63 Studebaker Avanti appears in an Archie Comic book, Pals n Gals "Giant" series, copyright© 1962-63 Archie Comic Publications, Inc.